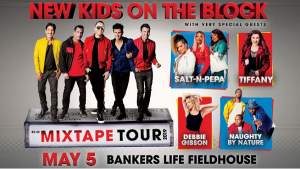 New Kids On The Block are bringing The Mixtape Tour to Bankers Life Fieldhouse on Sunday, May 5th. They’ll have special guests Salt-N-Pepa, Tiffany, Debbie Gibson and Naughty By Nature. Tickets are on sale now.